“Welcome… back…” With mixing feelings in her heart, the shy little rabbit, Lu Lu stood forward bravely and hugged Yun Xi proactively. “Tok! Tok!” Hua Huo’s body suddenly shivered while talking with the twin witches. She took a glance at the Starwing Knights girls and saw a rabbit-ear girl was hugging her Little Xi. No, no, it must be my delusion! My Little Xi’s disguise is perfect, it isn’t possible even for a legend ranked being to see through his disguise! She hasn’t even reached the hero rank, how can she be a threat! Hum, hum, how can anyone expect that I dressed up my lover as a maid?! Nothing is safer than this, my decision! No problem, my Little Xi is an upright gentleman, how can he be tempted by such a “little rabbit”! He isn’t that shameless White Emperor, who didn’t refuse the girls from all races! “Bang! Bang!” Yun Xi could clearly feel that Lu Lu’s heart was pounding heavily. Her fingers lightly slid across his black hair and stealthily pressed on his back, as if she was confirming the figure of his body. No, she can’t recognize me. After all, my body now is different than when I was the White Emperor. She can’t recognize me using this method! Yun Xi sweated profusely for fear of being exposed in the next moment. Fortunately, Lu Lu hesitated for a while and finally gave up. 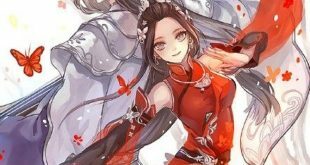 “Mei, can I eat your yummy bread again?” Lu Lu asked tentatively and looked at the black-haired maid in front of her, trying to find the truth through his eyes. “Well, of course!” Yun Xi let out a sigh of relief and made a decision in his heart that he would never make the special golden bread for these girls again. His identity would be immediately exposed if they tasted his hero ranked bread! Fortunately, he had only made them in the Water God’s world. As long as he didn’t make them in the outside world again, he wouldn’t expose himself. If he just made common bread, it shouldn’t cause any problem, after all, it’s a natural thing to be good at cooking as a maid. It just looked like Lu Lu doubted him, but wasn’t sure about it. If possible, Yun Xi hoped that she would forget everything that had happened in the Water God’s world. He felt embarrassed about the things he had done before. If he knew that it wasn’t just a dream, he would’ve never made those mistakes! Fortunately, he still could make a fresh start, he decided to be an upright gentleman! Just treat the things in the Water God’s world as my dream! At any rate, it was a too ridiculous experience. Well, that’s all. Even though I have done this thing and that thing with Lu Lu, the three High Priestesses, the… No, I shouldn’t keep thinking! Forget them, forget them! From now on, I will begin my life anew, I will study hard, then escape again and get free to explore the vast god’s domains! I should never forget that the threat from my four ex-girlfriends, still exists. If they catch me, everything will be over! He wasn’t really going to abandon his one million brides in the Water God’s world, he just knew that he couldn’t undertake this responsibility now. If it wasn’t because his four ex-girlfriends were still hunting him or Hua Huo suddenly appeared, perhaps he would’ve really stayed in the Water God’s world as the White Emperor. Even though he had saved an entire world and married a million brides, Yun Xi was just a boy who was being troubled in matters of love. Walking along the road the stars made for him, he still needed to practice and study harder! “Life is full of sufferings…” Yun Xi wiped off the sweat from his forehead, then suddenly heard a voice echoing beside his ears. “Who?” Yun Xi looked around alertly, then surprisingly found that the voice was from the person on the throne. The sixth Sky Sword, the Battle God, Casina. Apparently, she wasn’t being deceived by his disguise and clearly knew his real identity. Oh, no, I’m done for! If she exposes my identity, what will my life become?! In the night, Yun Xi stealthily walked out of his room and looked for Casina’s room. At present, the Sword Palace team was on a floating ship which was far bigger and faster than the floating ship White Lotus. Its name was “The Sands of Time”. From the name, Yun Xi knew that it must be Casina’s ship. A lazy voice appeared. Yun Xi looked up and saw Casina laying on a bed made of transparent jellyfishes. She was only wearing a dancer dress and looked at him with a spurious smile. “Ok… well… why me…?” Yun Xi walked to her nervously. He wasn’t the White Emperor at this moment and wasn’t wearing the three artifacts, he was lacking in self confidence when facing Casina. “Because it’s you, so I choose you.” Casina drank a blood colored wine and looked at Yun Xi with her hazy eyes. “But I refused.” Yun Xi pretended to be innocent. He couldn’t be the Battle God’s disciple, no matter whether he was in the identity of the White Emperor or Yun Xi. “Ah!” Yun Xi was dumbfounded.